Pole barns are a popular solution to the storage and shelter needs of many farmers. However, pole barns do not afford the farmer the convenience and practicality that a steel building offers. A pole barn has wooden rafters that encourage birds to perch and defecate on machinery housed below and take up valuable space. 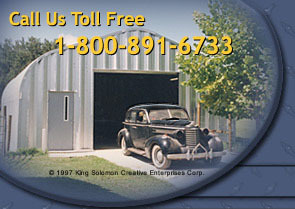 In contrast to the pole barn, a steel building allows the owner to utilize all available space since there are no rafters to obstruct as is the case with a pole barn. Pole barn kits contain many more pieces and their owners cannot erect them with the ease in which as few a three people can construct an arch-style steel building. Considered a steel pole barn, a web truss system, like any other pole barn, has rafters that take up valuable space and provide a roost for birds.